After opening with an insert of a ringing bell on an alarm clock, the camera starts in close on Mary’s face, pulls back to reveal her in bed, holds as she rises and stretches, then follows her to a window where she raises the shade and lets the sunlight in. The camera continues to follow Mary through her apartment, occasionally cutting to a different shot, but preferring to stay with her in real time as she moves from task to task. In many films of the period, the action in Mary’s room would have been covered in a single, stationary shot, either as an economical way to record the perfunctory, everyday actions or as a way to frame and define Mary by the limits of her tired, shabby apartment. But this is a strategy never adopted by Fejos. Instead, he films the sequence almost as if he has never seen someone wake up and get ready for work—as if he can’t imagine a more compelling activity. When the film cuts to Jim’s apartment, the camera tracks through it also, revealing information and following Jim around with the same curiosity and insistency it showed for Mary. The rough, unplanned look of the photography along with a camera that pans, dollies, and precedes Jim and Mary with an almost cinema verite doggedness gives the film a kind of documentary immediacy. At other times, however, the film, in a schizophrenic shift in style, has a decidedly experimental/expressionistic look. During an extended montage of Jim and Mary at work, the camera pans back and forth between the two. The image of a clock is superimposed on the border of the frame and slowly ticks off the hours yet to be worked. 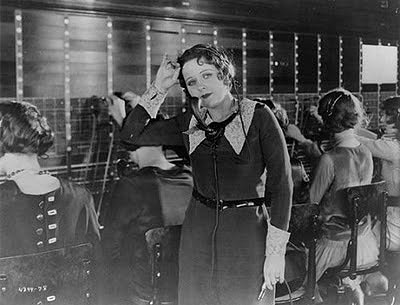 At one point, the camera tracks down a row of telephone operators, stopping on Mary as she works the switchboard, the mounting number of calls coming in represented by the faces of people superimposed around her, piling up in frame as demand increases. Meanwhile, Jim works at a punch press, pounding out the steady, grinding rhythm of the workday. Later, in a complete departure from any kind of documentary reality, Jim and Mary are seen against a black background, framed from the waist up, sitting on the beach at night. This sound sequence was added for financial reasons (so it could be released as a talkie) rather than any artistic consideration, but there is something disarmingly artless about the moment. After the relentless movement and visual invention that has preceded it, the static shot is startling, occurring as it does in a kind of parentheses to the rest of the action. Still wearing their swimsuits, Jim and Mary express their love for one another. The dialogue is unremarkable and awkward, but this only heightens an already uncomfortable feeling of honesty and naked exposure, both visually and emotionally. The scene ends with Jim and Mary matted into a shot of a fabricated beach, with what is obviously a miniature amusement park looming in the background. Although the image is in black and white, colors have been stenciled onto the amusement park, giving this moment, outside the rest of the film, a crude, childish sincerity. It is clear from the way Lonesome is constructed and shot that Jim and Mary will end up together. As Fejos cuts back and forth between the two, they continually mirror each other’s thoughts and actions. It is almost as if they had once been one, were separated, and now can only be complete again if they are reunited with their spiritual counterpart. Late in the film, while searching for one another at the amusement park, Jim and Mary are seen in profile, on either side of a canvas wall, and for a moment, they are literally reflected images of each other. 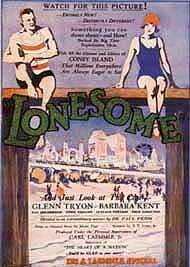 Admittedly, Lonesome is an uneven film, at times oddly stilted and at others overly frenetic. Nevertheless, it is also visually exuberant, and Fejos’s everything-but-the-kitchen-sink approach successfully marshals film techniques usually employed by Hitchcock, Gance, or Vertov. Although the film is far from being a stylish thriller, a historical epic, or even a head-scratching experimental film, Lonesome is, in its own way, just as ambitious. Maybe more importantly, it is a kind of film rarely seen on the big screen—then or now. It is a celebration of everyday life. Lonesome. Directed by Pal Fejos. Mary: Barbara Kent. Jim: Glen Tryron. This entry was posted in Movies by Jim Rutherford. Bookmark the permalink.